A kernel driver that will switch machine's CPU to a mode where it will be able to safely execute guest instructions. A userland emulator, which talks to the kernel driver to run virtual machines. Simply said, the emulator asks the kernel driver to run virtual machines, and the kernel driver will run them until a VM exit occurs. When this happens, the kernel driver returns to the emulator, telling it along the way why the VM exit occurred. Such exits can be IO accesses for instance, that a virtual machine is not allowed to perform, and that require the emulator to virtualize them. NVMM provides the infrastructure needed for both the kernel driver and the userland emulators. The kernel NVMM driver comes as a kernel module that can be dynamically loaded into the kernel. It is made of a generic machine-independent frontend, and of several machine-dependent backends. In practice, it means that NVMM is not specific to x86, and could support ARM 64bit for example. During initialization, NVMM selects the appropriate backend for the system. The frontend handles everything that is not CPU-specific: the virtual machines, the virtual CPUs, the guest physical address spaces, and so forth. The frontend also has an IOCTL interface, that a userland emulator can use to communicate with the driver. When it comes to the userland emulators, NVMM does not provide one. In other words, it does not re-implement a Qemu, a VirtualBox, a Bhyve (FreeBSD) or a VMD (OpenBSD). Rather, it provides a virtualization API via the libnvmm library, which allows to effortlessly add NVMM support in already existing emulators. This API is meant to be simple and straightforward, and is fully documented. It has some similarities with WHPX on Windows and HVF on MacOS. Fig. 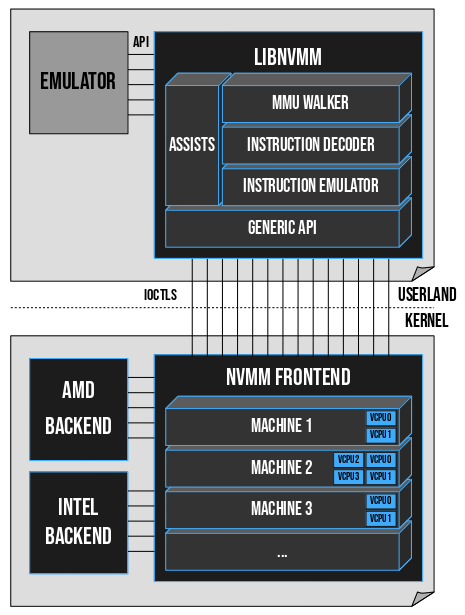 A: General overview of the NVMM design. The virtualization API is installed by default on NetBSD. The idea is to provide an easy way for applications to use NVMM to implement services, which can go from small sandboxing systems to advanced system emulators. Let's put ourselves in the context of a simple C application we want to write, to briefly showcase the virtualization API. Note that this API may change a little in the future. This creates a machine in 'mach', and then creates VCPU number zero (VCPU0) in this machine. This VM is associated with our process, so if our application gets killed or exits bluntly, NVMM will automatically destroy the VM. Here, we fetch the GPR component of the VCPU0 state (GPR stands for General Purpose Registers), we set RAX to '123', and we put the state back into VCPU0. We're done. The VM has its own MMU, which translates guest virtual addresses (GVA) to guest physical addresses (GPA). A secondary MMU (which we won't discuss) is set up by the host to translate the GPAs to host physical addresses. To give our single page of memory to our VM, we need to tell the host to create this secondary MMU. Fig. B: Memory relations between our application and our VM. Here we allocate a simple HVA in our application via mmap. Then, we turn this HVA into a special buffer that NVMM will be able to use. Finally, we tell the host to link the GPA (0x3000) towards the HVA. From then on, the guest is allowed to touch what it perceives as being a simple physical page located at address 0x3000, and our application can directly modify the content of this page by reading and writing into the address pointed to by 'hva'. The nvmm_vcpu_run function blocks, and runs the VM until an exit or a rescheduling occurs. We're done now: we know how to create a VM and give it VCPUs, we know how to modify the registers of the VCPUs, we know how to allocate and modify guest memory, and we know how to run a guest. Let's sum it all up in one concrete example: a calculator that runs inside a VM. This simple application receives two 16bit ints as parameters, launches a VM that performs the addition of these two ints, fetches the result, and displays it. That's about it, we have our first NVMM-based application in less than 100 lines of C code, and it is an example of how NetBSD's new virtualization API can be used to easily implement VM-related services. Libnvmm can go farther than just providing wrapper functions around IOCTLs. Simply said, certain exit reasons are very complex to handle, and libnvmm provides assists that can emulate certain guest operations on behalf of the userland emulator. The MMU Walker: the component in charge of performing a manual GVA→GPA translation. It basically walks the MMU page tree of the guest; if the guest is running in x86 64bit mode for example, it will walk the four layers of pages in the guest to obtain a GPA. The Instruction decoder: fetches and disassembles the guest instructions that cause MMIO exits. The disassembler uses a Finite State Machine. The result of the disassembly is summed up in a structure that is passed to the instruction emulator, possibly several times consecutively. The instruction emulator: as its name indicates, it emulates the execution of an instruction. Contrary to many other disassemblers and hypervisors, NVMM makes a clear distinction between the decoder and the emulator. An NVMM-based application can therefore avoid the burden of implementing these components, by just leveraging the assists provided in libnvmm. NVMM can be used in security products, such as sandboxing systems, to provide contained environments. Without elaborating more on my warplans, this is a project I've been thinking about for some time on NetBSD. One thing you may have noticed from Fig. A, is that the complex emulation machinery is not in the kernel, but in userland. This is an excellent security property of NVMM, because it reduces the risk for the host in case of bug or vulnerability – the host kernel remains unaffected –, and also has the advantage of making the machinery easily fuzzable. Currently, this property is not found in other hypervisors such as KVM, HAXM or Bhyve, and I hope we'll be able to preserve it as we move forward with more backends. Another security property of NVMM is that the assists provided by libnvmm are invoked only if the emulator explicitly called them. In other words, the complex machinery is not launched automatically, and an emulator is free not to use it if it doesn't want to. This can limit the attack surface of applications that create limited VMs, and want to keep things simple and under control as much as possible. Finally, NVMM naturally benefits from the modern bug detection features available in NetBSD (KASAN, KUBSAN, and more), and from NetBSD's automated test framework. Contrary to other pseudo-cross-platform kernel drivers such as VirtualBox or HAXM, NVMM is well integrated into the NetBSD kernel, and this allows us to optimize the context switches between the guests and the host, in order to avoid expensive operations in certain cases. Another performance aspect of NVMM is the fact that in order to implement the secondary MMU, NVMM uses NetBSD's pmap subsystem. This allows us to have pageable guest pages, that the host can allocate on-demand to limit memory consumption, and can then swap out when it comes under memory pressure. It also goes without saying that NVMM is fully MP-safe, and uses fine-grained locking to be able to run many VMs and many VCPUs simultaneously. On the userland side, libnvmm tries to minimize the processing cost, by for example doing only a partial emulation of certain instructions, or by batching together certain guest IO operations. A lot of work has been done to try to reduce the number of syscalls an emulator would have to make, in order to increase the overall performance on the userland side; but there are several cases where it is not easy to keep a clean design. As of this writing, NVMM supports two backends, x86-SVM for AMD CPUs and x86-VMX for Intel CPUs. In each case, NVMM can support up to 128 virtual machines, each having a maximum of 256 VCPUs and 128GB of RAM. Armed with our full virtualization stack, our flexible backends, our user-friendly virtualization API, our comprehensive assists, and our swag NVMM logo, we can now add NVMM support in whatever existing emulator we want. That's what was done in Qemu, with this patch, which shall soon be upstreamed. It uses libnvmm to provide hardware-accelerated virtualization on NetBSD. It is now fully functional, and can run a wide variety of operating systems, such as NetBSD (of course), FreeBSD, OpenBSD, Linux, Windows XP/7/8.1/10, among others. All of that works equally across the currently supported NVMM backends, which means that Qemu+NVMM can be used on both AMD and Intel CPUs. Fig. 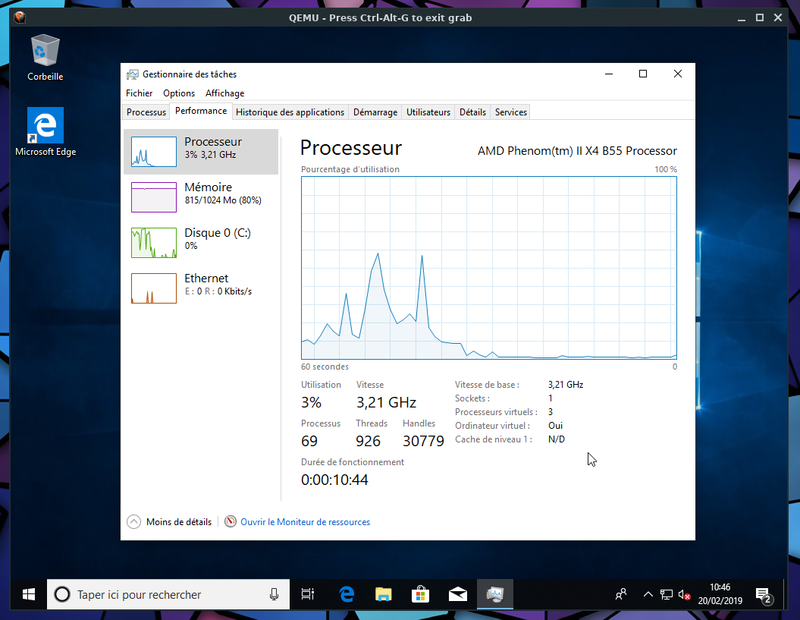 C: Example, Windows 10 running on Qemu+NVMM, with 3 VCPUs, on a host that has a quad-core AMD CPU. Fig. 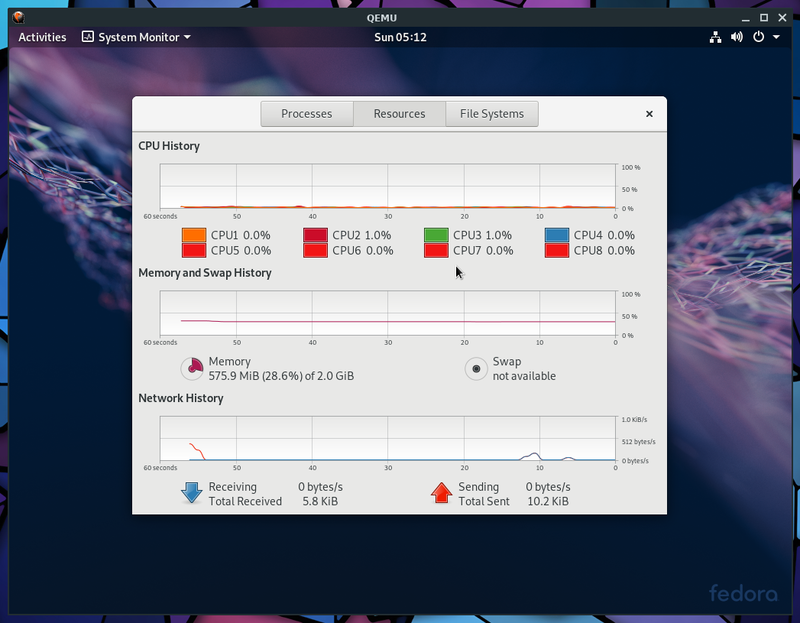 D: Example, Fedora 29 running on Qemu+NVMM, with 8 VCPUs, on a host that has a quad-core Intel CPU. The instructions on how to use Qemu+NVMM are available on this page. All of NVMM is available in NetBSD-current, and will be part of the NetBSD 9 release. Even if perfectly functional, the Intel backend of NVMM is younger than its AMD counterpart, and it will probably receive some more performance and stability improvements. There still are, also, several design aspects that I haven't yet settled, because I haven't yet decided the best way to fix them. Overall, I expect new backends to be added for other architectures than x86, and I also expect to add NVMM support in more emulators. That's all, ladies and gentlemen. In six months of spare time, we went from Zero to NVMM, and now have a full virtualization stack that can run advanced operating systems in a flexible, fast and secure fashion. Not bad at all, very nice:) Looking forward to giving this a try in the near future. Amazing work! Awesome! Thank you, I'll give it a try as soon as possible. Amazing work!! Looking forward to playing around and learning from everyone's hard work. This is really cool. Good virtualization support was the only thing holding me back from switching to NetBSD from OpenBSD. I wonder if there is PCI passthrough support? Or if it is a planned feature? Amazing! Thx!! Can hardly wait for it. Already looking forward to drop GlibC and use nvmm to run the litle I need from that side of the fence :) Thank you once again. Very nice! If there are more in-depth comparisons with other virtualization systems, it would be awesome to see.